Venus, Mars and the crescent moon will form a brilliant triangle in the southwestern night sky on Tuesday, Jan. 31, 2017. To compensate for its unfriendly chill, the coming night offers the unusual beauty of two twilight spectacles: Skywatchers are right in the midst of a nearly two-week-long duet of Venus and Mars at dusk, with these two planets forming a trio with the crescent moon on Tuesday evening (Jan. 31). Venus, of course, reigns supreme in the evening. Shining high in the southwest at dusk, this planet sets almost 4 hours after sundown. Mars, meanwhile, appears nearby but is dimmer, shining as a 1st-magnitude object on the brightness scale used by astronomers. On New Year's Day, the reddish planet was 12 degrees to the east (upper left) of Venus. But over the course of this month, the two worlds slowly approached each other as they progressed eastward against the dim stars of Aquarius and Pisces. And on Tuesday evening, a third celestial object — a waxing crescent moon — joins the Venus-Mars pairing. The three form an eye-catching isosceles triangle in the west-southwest in twilight. 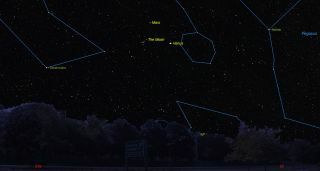 The Mars-Venus and moon-Venus legs measure 5.5-degrees in length, while the Mars-moon side of the triangle (the base) is 3.1-degrees in length. The trio will set beyond the western horizon, soon after 9 p.m. your local time. Venus will disappear first, at around 9:05 p.m., followed by the moon at 9:18 p.m. and finally Mars at 9:26 p.m. The triangle, of course, is an illusion of perspective as seen from an Earthly vantage point. The 17-percent illuminated crescent moon lies just 234,000 miles (376,800 kilometers) away from Earth, compared to 50 million miles (81 million km) for Venus and 172 million miles (277 million km) for Mars. Venus and Mars present some interesting contrasts. Their colors are sparkling white and ochre-orange, respectively. Increasing in brilliance, Venus (magnitude -4.7) outshines Mars (magnitude +1.1) by more than 200 times. The Red Planet, meanwhile has been dimming. Telescopically, Mars' waxing gibbous disk measures a paltry 5 arc seconds across. You would need a 14-inch (36 centimeters) telescope, magnifying at 360-power to get a clear image of Mars that had the same angular size as the moon seen with your unaided eye. Venus, on the other hand, has expanded to 31 arc seconds in diameter, more than six times larger than Mars, and now appears as a wide crescent in small telescopes. It's always best to observe Venus in daylight or shortly after sunset to avoid this planet's overpowering glare against a darkened sky. Indeed, Tuesday presents a good chance to find Venus in daylight. Once you locate the moon about halfway up in the south-southwest, late afternoon sky, you'll find Venus situated to the moon's upper right. If you have binoculars, train them on the moon and you'll easily spot the brilliant "speck" of Venus shining through the blue of the daytime sky. Joe Rao serves as an instructor and guest lecturer at New York's Hayden Planetarium. He writes about astronomy for Natural History magazine, the Farmers' Almanac and other publications, and he is also an on-camera meteorologist for Fios1 News in Rye Brook, N.Y.Follow us @Spacedotcom, Facebook and Google+. Original article on Space.com.